The Smithsonian’s National Postal Museum Library has a Small Journals collection located in the center of our reading room. We are currently working to catalog this collection and add records to our online public access catalog. These journals are incomplete runs of short lived, hometown newspapers and newsletters, written by everyday people who lived in the neighborhood. What makes these journals special is that many times they are not found anywhere else in the world– only at the Smithsonian. They were donated sixty years ago by Smithsonian Curator George Townsend Turner (1906-1979). He owned the greatest private philatelic library ever assembled. Powell, Perry Edwards, Tipton, Ind. 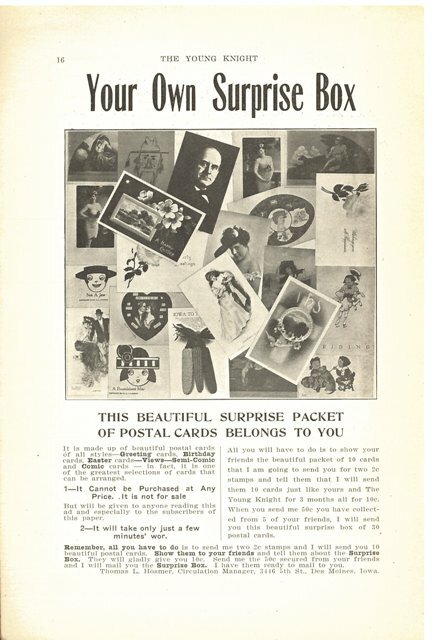 The Young Knight, Jan.1911, page 16, an ad for free postcards with a paid subscription to this journal. Stamp collecting enthusiasts are often called philatelists. They have their own special culture. There are several stamp clubs throughout the United States, so we have a variety of Small Journals from almost every community and town and hamlet you can imagine. Powell, Perry Edwards, Tipton, Ind. 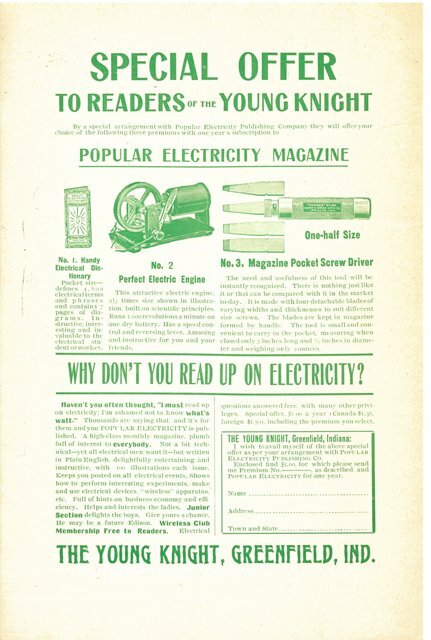 The Young Knight, Dec.1910, title page verso, an ad for one of 3 free gift offers with a paid subscription. One notable title in this collection is Young Knight. This journal is full of amusing stories, anecdotes and hand drawn, authentic illustrations. It was written in the 1910s and we have 14 issues of it in our library. The neighborhood setting is Greenfield, Indiana (population 4,448 at the 1910 census) and Tipton, Indiana (population 4,075 at the 1910 census), and the publisher is the Knights of the Holy Grail. Sometimes publishers wished to remain anonymous. The focus of this magazine seems to be finding the Holy Grail, singing about the Holy Grail, knights’ rituals, knights’ badges, coming of age, the coronation of King Arthur, and Boy Scouts, as they relate to philately (stamp collecting). Powell, Perry Edwards, Tipton, Ind. 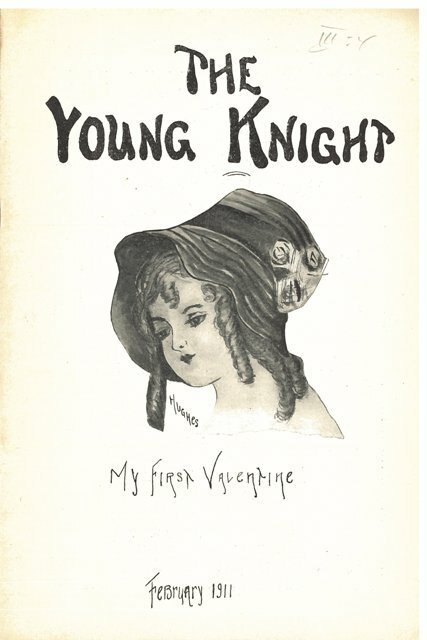 The Young Knight, Feb.1911, cover page, an illustration by Hughes about Valentine’s Day. Powell, Perry Edwards, Tipton, Ind. 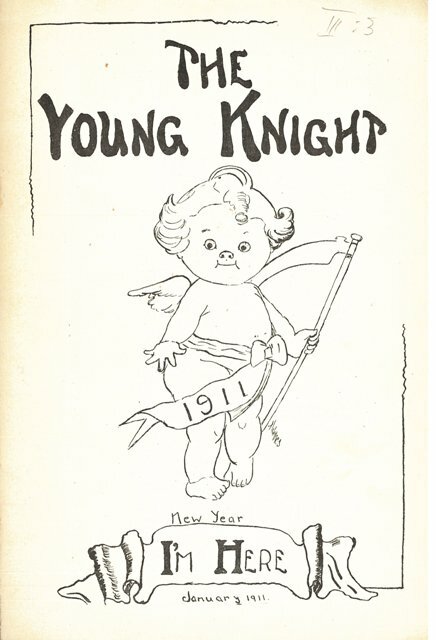 The Young Knight, Jan.1911, cover page, an illustration of Baby New Year. Powell, Perry Edwards, Tipton, Ind. 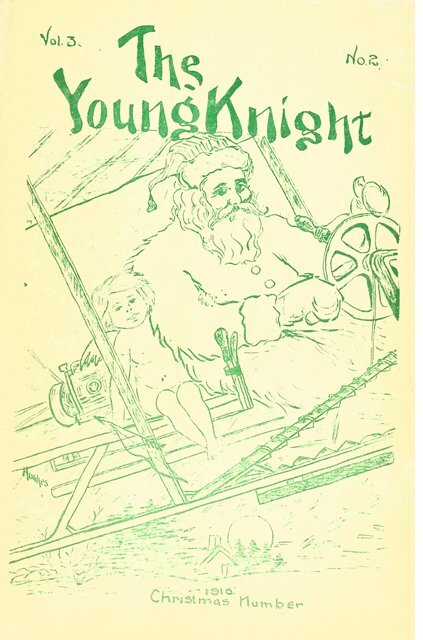 The Young Knight, Dec.1910, cover page, Santa with a cherub in his sleigh. Powell, Perry Edwards, Tipton, Ind. 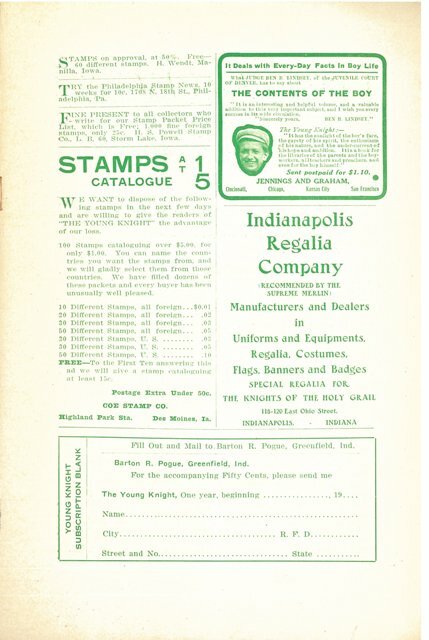 The Young Knight, Dec.1910, page 17, ads selling stamps and holy grail uniforms. Powell, Perry Edwards, Tipton, Ind. 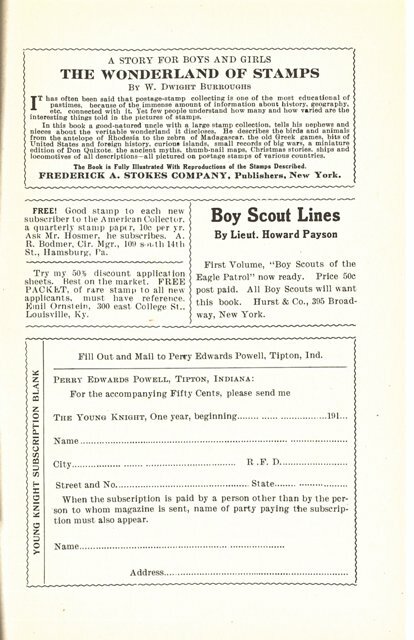 The Young Knight, Apr/May 1911, page 21, book reviews and subscription ads.